Residing in a southern state like North Carolina (NC) has a significant impact on how one is able to live a healthy and high-quality life. As a matter of fact, if you were raised in the south, you’re expected to die up to 20 years sooner than your counterparts who were raised in other areas of the country due to our severe barriers to care. As a born and bred southerner raised in South Carolina and currently residing in NC, I have pride in and an admiration for southern culture. However, as a healthcare administration professional, I realize that there is work that needs to be done to fix the obstacles creating such a disparity in longevity for me and my fellow southerners. I believe we can rewrite this health narrative and positively impact the lives of the communities where we stay, play, and pray. Let’s begin transforming the health narrative of NC by discussing each of the top five barriers to care and how we can address them to create positive change. NC currently ranks 47th in the nation for disparities in health status. Health status disparities are differences in health between population groups. These differences occur across many dimensions, including race/ethnicity, socioeconomic status, age, location, gender, disability status, and sexual orientation. Unfortunately, the color of your skin, your zip code, and your income level play a major role in predicting whether or not you will live a healthy, high-quality life in NC. 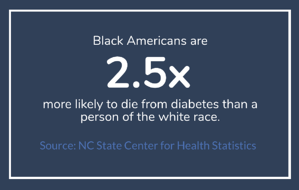 The NC State Center for Health Statistics reported that Black Americans (people of African descent) are 2.5 times more likely to die from diabetes than a person of the white race. This disparity doesn’t stop at race; within the white race, the less education you have, the more likely you are to die from diabetes. As the NC population becomes more diverse, it’s becoming increasingly important to address health disparities because they limit both the groups facing them and the overall gains in quality healthcare for the broader population. Utilizing platforms like Unite Us that bring together professionals from a range of sectors (e.g. transportation, healthcare, environment, labor, education, and housing) with community partners to ensure that community health needs are identified to better coordinate care. Training and hiring more qualified staff from underrepresented racial and ethnic minorities and people with disabilities. Collecting data to identify populations at greatest risk and working with communities to implement policies and programs that address these highest priority needs. According to the University of North Carolina-Chapel Hill Health Literacy Map, 80% of the counties in NC have populations that are below the baseline for basic health literacy. Health literacy is the degree to which individuals have the capacity to obtain, process, and understand basic health information and services needed to make appropriate health decisions. For NC, the key influence in the barrier of health literacy is culture. Culture affects how people communicate, understand, and respond to health information. Health professionals have their own culture and jargon which is a result of their many years of training in the medical environment. When health professionals adopt the “culture of medicine,” a gap arises in how these professionals communicate with the public, creating a communication barrier between the healthcare professional and patient. Helping ensure that prevention strategies are culturally, linguistically, and age appropriate and that they match people’s health literacy skills. Partnering with local resources such as libraries and literacy programs to enhance employees’ abilities to identify and use reliable health information. Conducting outreach to increase the diversity (e.g. racial/ethnic, income, disability) in healthcare and public health careers. 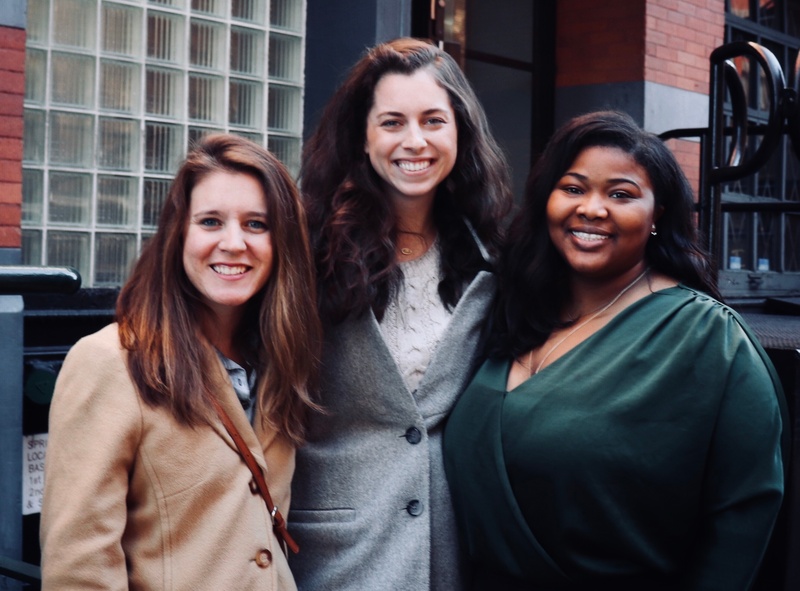 Utilizing a platform like Unite Us that supports care coordination across sectors so that our community will have access to community resources (e.g., libraries, literacy programs) to improve their ability to read, understand, and use health information. Access to affordable, quality healthcare at the right time, right place, and with the right provider is crucial to our health. Throughout NC, there are large regions with only a few major healthcare providers. For example, areas in Western NC are dominated by one hospital system. The lack of competition in these areas not only increases cost of care, but also makes it difficult for insurers to negotiate lower prices with the health systems. On the contrary, some of the most affordable healthcare in the state resides in areas that have a dense pool of health systems like the Triangle served by Duke Health, UNC Health Care, and WakeMed. With over 80% of the counties in NC being considered rural, access to transportation to facilitate the distances between residences and health services is a necessity. A research study conducted across 12 counties in Western NC showed that those who had a driver's license had 2.3 times more healthcare visits for chronic care and 2 times more visits for regular checkup care than those who did not. Individuals who had family or friends who could provide transportation had 1.6 times more visits for chronic care than those who did not. This study indicated that access to transportation played a significant role in one’s ability to receive the right care at the right time by the right provider. Companies like Lyft, that are taking innovative approaches by partnering with nine of the ten largest health systems in the nation to alleviate access issues due to transportation. Incentivizing health professionals to practice in areas that lack diverse healthcare resources. 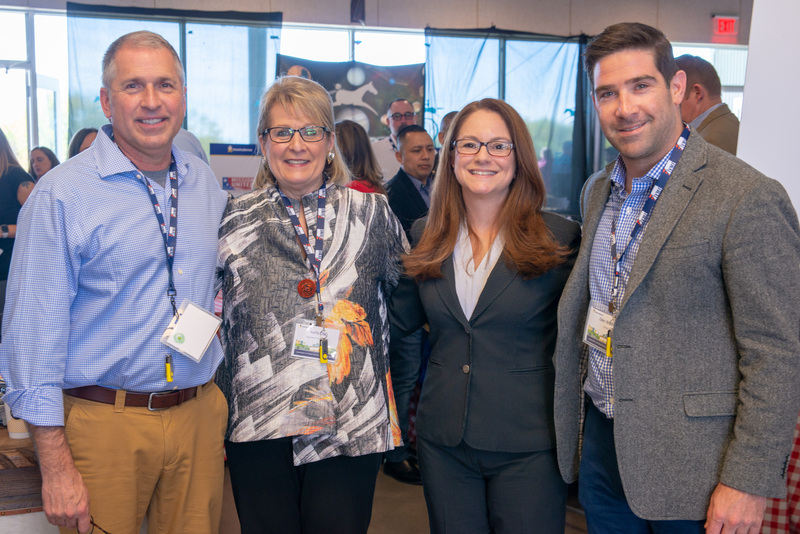 Embracing solutions, like Unite Us, that enable us to coordinate services across boundaries for patients to receive the excellent care that we offer in our NC health systems. Food deserts, defined by the United States Department of Agriculture (USDA) as "urban neighborhoods and rural towns without ready access to fresh, healthy, and affordable food," are a significant problem in NC as we are ranked 42nd in the nation for food security. 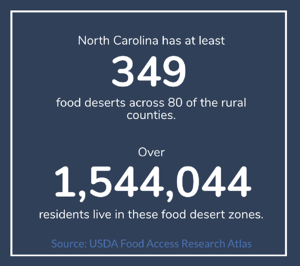 One would assume that because NC is heavy in agriculture, access to healthy foods wouldn’t be an issue, but contrary to popular belief, food deserts exist in our state. One out of every three adults are considered obese in NC, and residents living in food deserts are more likely to suffer from obesity, diabetes, cardiovascular disease, and other diet-related conditions. These conditions often call for the long-term use of expensive prescription medicines and costly diagnostics and procedures. Improving education about food access and healthy eating through farmer’s markets. NC currently ranks 40th in the nation for opportunity to thrive and 43rd for economic opportunity. Opportunity to thrive versus poverty in NC is significantly associated to where you live. In Camden County, the poverty rate is 7.9% while in Robeson County, it is 31.6%. 40 of NC's 100 counties have a poverty rate of over 20%. Data released by the Census Bureau show that 1.6 million adults and children remain in poverty in NC and these individuals need to use every bit of their money towards critical needs like rent, child care, and groceries. These individuals often pay a premium for rent and food because of bad credit and inability to travel to or live in cheaper markets. While getting less value for their already extremely limited dollars, poor families are exposed to threats that affect not only their health, but also child development and employment. With a graduation rate of 86% and one out of every five children younger than age 18 living in households at or below the poverty threshold, how can we ensure there is more opportunity in NC? Thinking outside of the box to garner more opportunities to thrive instead of fall into the welfare and poverty categories could transform this barrier into an advantage. 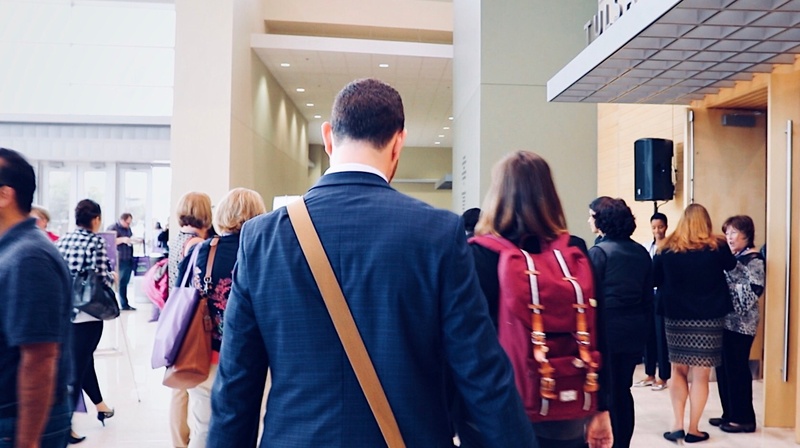 Develop and implement local strategies to reduce health, psychosocial, and environmental conditions that affect school attendance and chronic absenteeism. Address the lack of affordable, high-quality child care and early education. Low-wage and hourly jobs are becoming increasingly unpredictable, which means workers struggle even more to balance erratic work hours with caring for their families. Create schedules and policies that require adequate notice before shift changes. Coordinate care via platforms like Unite Us so that those who have fallen victim to poverty can quickly overcome and receive the resources they need to become self-sufficient. These five barriers and many more lead to unmet health needs, delays in receiving appropriate care, financial burdens, and preventable hospitalizations, but with passionate discussion and innovative approaches, we can overcome and rewrite the health narrative for North Carolina.